NOTHING REST, BUT THE BEST! Warm greetings to you at STUDY CAMPUS, the best of the platform aiding you the launching pad for your dream NDA career in the entrance examination. Maintaining its connoisseur position in cracking the esteemed exam, we at our institute have exclusively designed a curriculum that is highly scientific in approach. As a result, it gives our students the edge that makes them stand out amongst the crowd of masses. What is meant by NDA? 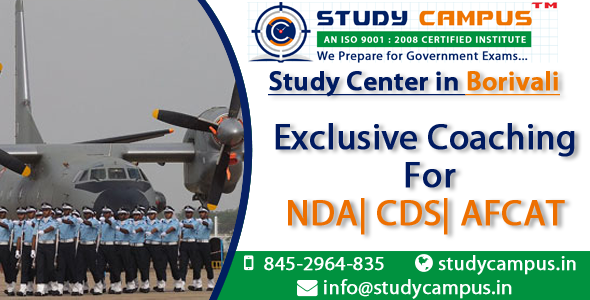 NDA is one of the most venerated academy that is the key to any student who dream his career in the Indian Armed Forces. However, the entry to this prestigious academy comes with the cracking of an entrance exam, held every year by the UPSC. To make sure that our students stand out amongst the rest, we have made sure that we facilitate them with the best of the equipments possible. However, if you still have inhibitions about joining us, we are here to clear your doubts. Our institute holds the prestige of having the highest success rate in the nation. Our coaching conducts weekly assessments. Latest training facilities aiding to better assimilation. Free online tests are made accessible to our students. Students not only from Borivalli but also from Kandivali East are enrolled with us. So without waiting give your career the height that it deserves. Join us now!